This drum cake was made for my son's 20th birthday. The cake itself is red velvet. The small "snare" drums were trimmed down because I didn't have smaller cake pans. The larger drum is two 8" wilton rounds that I stood on end. I tinted buttercream frosting as black as I could get it for the sides of the drums and left the center white. 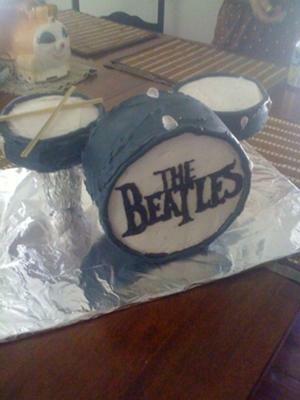 The Beatles writing is done with a true black tube of frosting. Don't laugh, the drumsticks are three shish kabob sticks cut down to size and hot glued together and the drum "stands" are juice glasses covered in foil! I received a lot of compliments for this cake (and you know we all live for our compliments!). The most important thing was that my sons really loved it. LOVE IT! Brilliant and I have every intention of copying your idea. I am dying to know how you made the large cake stand up on its side and how people were able to cut into it? I never would have thought to use glasses!